City Lights Gallery is at 7 Markle Court, Bridgeport. A special "Judaica" event is Sunday, Nov. 16, beginning at 4:30 p.m. $5. 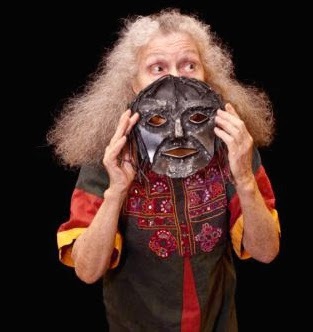 Also renowned as a painter, sculptor, printmaker and mask maker, the Ridgefield artist said last week that she views herself as a "trans-culturalist and feminist" who has been devoted to her art and storytelling since the mid-1970s. In her artist's statement, Benton says: "Believing that the purpose of art is to explore humanity and that art comes alive as it relates to people's lives, my art draws upon multicultural themes and engages participation. I consider my work as a bridge between cultures." Benton said women of the Bible "as seen with a contemporary eye" is one of her favorite subjects. For Sunday's performance, she is focusing on Esther, who according to the Bible was a Jewish queen of the Persian King Ahasuerus. Also featured will be the tale of Job's first wife, who appears to have been cast off even when Job's torment and suffering end and his glorious former life is restored, according to Benton. At 6 p.m., following Benton's performance, a film screening of "Irwin," by Dan Makara and Frank Borres, will explore the life of Irwin Hasen, a comic artist, and co-creator of "Dondi." Exhibiting artist Arlen Schumer will present "Jews and Comics," a "survey and slideshow of Jewish comic artists, illustrators and editors who have influenced American pop-culture of the 20th century to the present, creating many of our super-heroes including `Superman' and `Captain America,' " said gallery Director Suzanne Kachmar. The presentation is 6:30 p.m. Friday, Nov. 14, preceded by light refreshments at 6. The "Judaica" show features monoprints by Benton and works by Binnie Birstein, Camille Eskell, Roxanne Faber Savage, Leona Frank, Roe Halper, Lisa Hess Hesselgrave, Joan Jacobson-Zamore, Hope Lourie Kilcoyne, Hank Paper, Mark Schiff, Arlen Schumer, Larry Silver and Joan Shapiro.